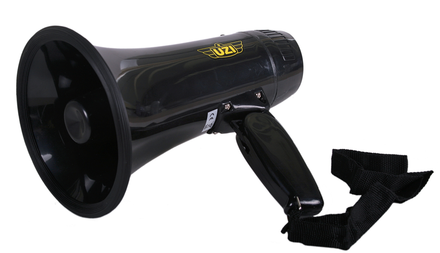 Ultra portable yet ultra powerful megaphone. Great for sports teams, pep rallys, emergencies, even protests. Comes with a built in microphone, siren, foldable handle, can even record a message for repeat playback. Uses 4 C cell batteries and comes with a wrist strap so it won’t fall off your wrist while you are being arrested for protesting without a permit.